Question concerning condensing boilers/heating systems. I was always told to get a boiler to condense, we needed a return of minumum of 40 deg, better being 50 deg, delta T. So, if i need a supply temp of 180 deg, I wont truly be condensing unless i have a return of 130 deg, while needing to maintain my supply of 180 out. My boiler would need to be able to heat the "media" 50 deg. If that makes sense or not, tell me i'm wrong. Yesterday though, i had a (controls) programmer tell me i'm wrong. 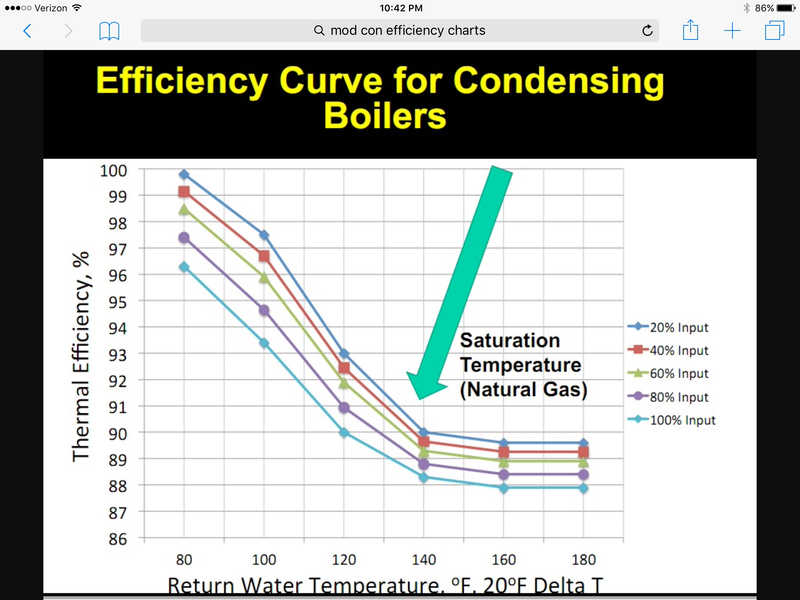 It has nothing to do with delta t, and is only condensing if the boiler is run at a lower temp, 120 deg or so. ( and cant condense at 180 deg supply) Essentially he said, running a system at 120 deg with a delta T of 20 deg, would be more condensing than running at 180 deg with a 40 deg delta T. Granted the system has to be designed for either way. Your tech is correct -- it has nothing to do with delta T and everything to do with the return water temperature. The programmer is correct: it's dependent upon return water temp, not delta T.
so what does the Return water temp have to be? compared to the supply temp, to be condensing? It doesn’t have to be anything compared to the supply temp as the supply temp is irrelevant to condensation of the exhaust stream. The return temp needs to be cold enough to condense the water vapor from the exhaust stream. It isn’t a binary thing it is analog so colder return is better, but much above 130 and condensation gets really low to nonexistent. you see now, we are getting somewhere. A return of 130 deg or less, doesnt matter the supply. The control tech said the "supply" had to be 120 or less. I suspect the tech said that because it is hard to run a system with a very high deltaT. Running the supply at 120 guarantees the return will be cool enough for good efficiency. Yes, most non-radiant systems are designed for 160 or higher temps. Given that, how are you going to run a high temp system and still get into condensing mode? You would have to run very low flow rates and then you would have a huge heat output difference between the radiators on each loop. If the first radiator is seeing water at 180 and the last one is seeing water at 120, you are not going to have happy people in the last room on the loop unless the radiators were designed to run at 120. So, I suspect the tech was just offering practical advice given that running at delta T values above 20 or so is rarely practical unless you have a system designed for that from the getgo. No condensation with return water above 130 F. The LOWER the return water temperature the more condensation=more fuel savings. Most systems are designed with a maximum TD supply to return of 40 degrees....others may have better information or disagree. so if you ran 140 supply and 100 return (40 TD) you would design the radiation at 120 degrees ---halfway between 140 & 100 this is your average water temperature. 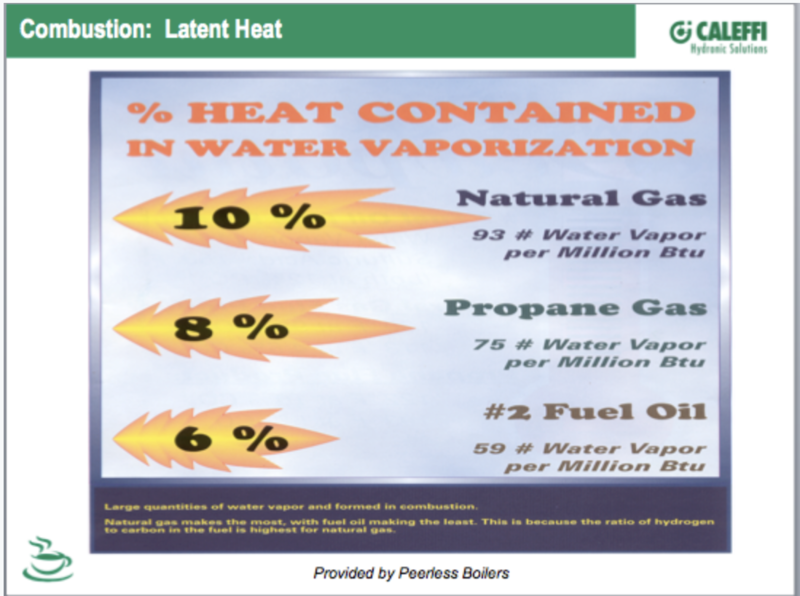 Our gas utility has done many years of study on the temperature of heating systems. Here in the Great White North, heating systems run 1000 hours of which only 100 hours work at system design be it 160F for cast or 180 F plus for baseboard. Therefore by using the outdoor temperature versus system temperature substantial savings are available with a mod-con. Even when running at higher temperatures the mod--con are more efficient at between 86 to 88% for that 100 hours depending on the manufacturer. The savings on a baseboard (180F) application is between 30 and 50%. It depends on the install, programming and the occupants. If you have copper baseboard and if you have extra wall space you can add more copper baseboard and get your system to run at lower supply temps and thus you will have lower return temps. There are copper baseboard that has a bigger element and delivers higher BTU per foot at lower water temps. Get someone to run a heat loss on your house. You might be able to run your system at lower than 180 F supply temp. You can do outdoor reset on a regular gas boiler but supply temp needs to be about 140 F to make sure your regular boiler does not condense. 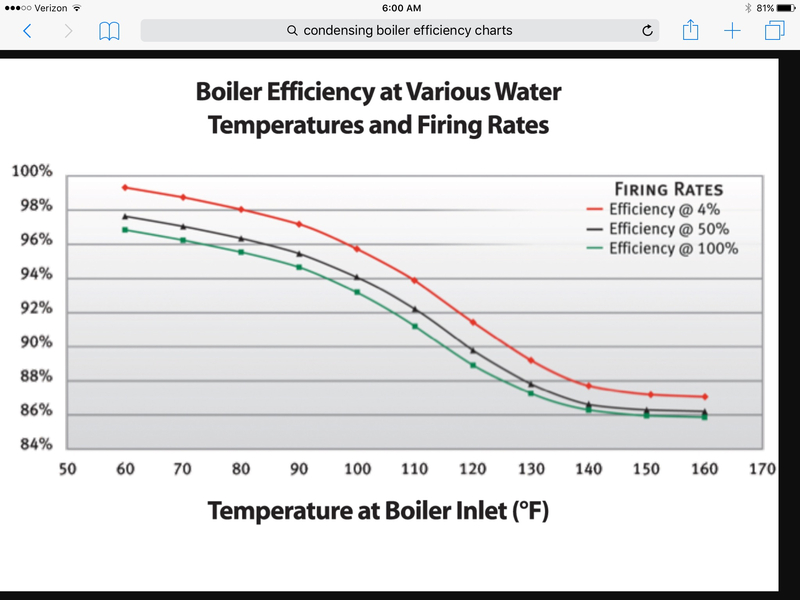 Check with your boiler manufacturer to see what the minimum return water temp can be. If running lower supply water temp from a regular gas boiler will this effect the flue temp going into the chimney. Will that cause a problem with your chimney? Lower the supply temp, lower the output from the emitter, so delta T drops further unless you really slow the flow rate. But as mentioned, if multiple radiators are in series, you’ll hav ea large imbalance in heating. Compromise is usuing outdoor reset so that at least part of the year, maybe 50% of heating degree days, you in lower water temps and get effeciency above 88% (the efficiency of most condensing boilers with return water above 130F). Ideally, the water temp matches whats required to maintain indoor temp so output is constant and matches building heat loss without cycling on and off. You do this the same way a commercial chilled water system modulates the water flow to a coil and air flow to a coil. FUrther you are below setpoint, the more “boost” you add to the water temp. If temp i above, you reduce the water temp. It’s a simply reset curve used in most commercial systems to compensate for internal heat loads (occupancy, solar gain, equipment). As you can see by the charts I posted, modulation also plays a key role for a couple extra points in efficiency. The lower the modulation, and return water temp the higher the efficiency. Remember using outdoor reset is important part of the equation. It’s going to modulate the supply water temp based on the outdoor temperature. The media, or emitter does not need 180 degrees all of the heating season, and probably about 3% of it. From there cooler supply water temps can be used to get those return temps lower on warmer than design temp days. You can work around the low supply and return water temperature problem with piping alterations and hydraulic seperation. I changed my boiler to primary secondary piping with variable speed injection pumping to combat flue gas condensation. I have no problem with keeping return water temperature above 140, even when outdoor reset brings the high limit down to 155 on mild days. And it's eliminated short cycling. The same can be accomplished with a three way valve. This system is mostly Heat pumps, and make up air units. It is my belief that this system was designed for this, changes through the years have messed with this. The make up air units have "huge" coils in them. The zone valves are barely open tho provide the required output temp. I do believe this system was designed, originally for a higher delta t, and since been "changed' due to non experienced personnel. Were really getting into the "system" now, which i didn't include. But the part of the system in question, serves some make up air units, which (through changes over the years) (before me) the system has been altered. The modulating valve is barley open serving said make up air units, and which brought me to the point of, the system was designed for something much different than the current operation. They are running with a 20 deg delta t, at about 170 deg, and my belief is it was designed to be a greater delta t, which might make the boilers condensing. When i was talking to one of the (subs) control techs, to find out some info, which is when he told me we would have to run with a 120 deg supply to be condensing. I believed that to be incorrect. I always see boilers condensing at around 160F return temperature when system is properly set up. Statement of condensing only at 130F and below is false. I would say it is fake news. If you look at the properties of saturated steam, the temperature of phase change for water at atmospheric pressure is 212F, as you lower temperature of steam at atmospheric pressure steam starts to condense. Vapor in the exhaust gases is steam, (water is gaseous state). All what is needed is exhaust gases be in contact with heat exchanger surface long enough to cool down to temperature below 212F. Size does matter in this case. Viessmann heat exchangers are unique in this aspect, they have much larger surface that other comparable in size heat exchangers. Of course, it is just my opinion. Sufficient heat energy needs to be removed from the vapor to reach the dew point. 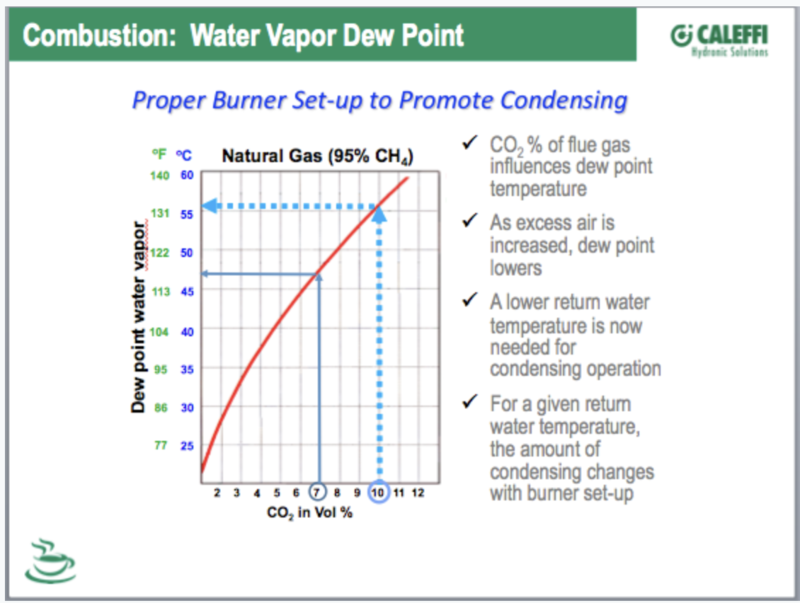 Dew point and required temperature varies with different fuels and the CO2 content of the exhaust. Which is one of the key numbers to watch on your combustion analyzer. Jody Samuels of Viessmann presented a couple excellent webinars for us a few years back on the theory of condensing and designing around it. Here is the link to our You Tube channel, lots of great info. Not so much it won’t condense it’s about how much efficiency climbs at a given return temp, and modulation range. Measuring the quantity of condensate at 160 verses 130 verses 100 there is quite a difference. I never said there was no condensation above 130. I said it was low to nonexistent and I stand by that. The efficiency difference between 130 and 180 is about 1%. The difference between 130 and 120 is also about 1%. That gives you an idea how fast efficiency ramps below 130 compared to above it. 130 is where the “knee” in the curve is and that makes a lot of difference.